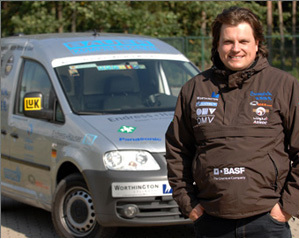 After the success of his first natural-gas-powered round-the-world drive (www.ecofuel-world-tour.com) - which found its way, as did his setting of an altitude record for a standard-production car (www.touareg-record.com), into the Guinness Book of Records - expedition leader Rainer Zietlow is now about to realize a new automobile-related project: the EcoFuel Asia Tour. Zietlow and his photographer Franz Janusiewicz will be using once again, in their drive from Berlin, via Moscow, to Shanghai and Bangkok, that same Volkswagen Caddy EcoFuel which has already proven its worth on the earlier round-the-world trip. The greater part of the journey will be made on natural gas alone; only in the Himalayas will the petrol tank, standard in this model, be used. One of the goals of this spectacular special event is the first overland visit in a European natural-gas automobile to the world’s most populous country. Natural gas, as a source of energy for automobiles, is playing an ever more important role in China. In addition, the EcoFuel Asia Tour will also be the first practical test for a granulate produced by nano-technology with which it will be possible, in the near future, to increase the range of natural-gas automobiles by up to 30%. The marathon journey starts on 17th September in Berlin and will lead the two adventurers to Russia, the Middle East and India, before they reach China and visit the http://www.challengebibendum.com in Shanghai on 14th and 15th November. The team will then continue its journey driving to Vietnam, Laos and Thailand. At the end of the EcoFuel Asia Tour, after 22,000 kilometres and 10 weeks, the Volkswagen Caddy EcoFuel will be presented at the 2nd Biennial Conference and Exhibition of the Asia Pacific Natural Gas Vehicles Association www.angvaevents.com that takes place in Bangkok from 27th to 29th November 2007. 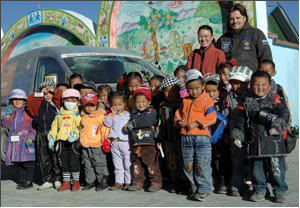 Rainer Zietlow will be donating 20 cents for every kilometre of this journey to SOS Kinderdorf Children’s Villages in Kathmandu/Nepal and Lhasa/Tibet. This sum will be handed over by him personally at these sites. The internationally active organization www.sos-kinderdorf.de have made it their job to be there, without limit or condition, for every child who need their help.